Day of rest. Went to church. 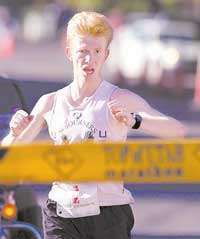 We had Polina with us again - she is back for Deseret News 10 K and Timp Half. So we went to the Russian branch in Salt Lake, and then watched Meet the Mormons on Temple Square. Desnews 10 K, 34:14, 35th overall, 2nd master. Jason Lynch won with 28:58, then Josh Collins 29:30, Nico Montanez 29:38, Mike Hardy 29:51, Travis Fuller 29:57. Masters winner was Iain Hunter with 31:48. Dave Taylor was right behind me with 34:22. Womens top 4 was Taylor Ward 33:22, Rachael Young 34:33, Polina Carlson 34:40, and Rena Elmer (new married name, she is better know as Chesser) 35:03. I jumped in the race to get a good hard workout before the trip to Kansas for USATF JO Nationals. The race was not on the circuit and there was nothing special for the masters, but I still wanted to get the legs moving. We did a tricky driving maneuver this morning. I drove my daughter Jenny and Polina to the start. Then Jenny drove to the finish. Then Sarah came in the van with the rest of the kids (except for Benjamin). Then I drove the family to Denver (our stop at the Winzenz house en route to Kansas) while Polina drove our car back to our house where she is staying for the week. Splits by the mile: 5:04, 5:11, 5:32, 5:31, 5:36, and the rest of it in 7:20 which is 6:02 pace. The last mile is actually a visibly small but significant uphill while the rest of it is downhill of varing degree. I was wondering why the last mile was so slow, and even wondered if perhaps mile marker 5 was misplaced, but then I remembered that I did more or less the same mile going the other way in 4:50 at the start of the Salt Lake City 5 K a few years ago, and it all made sense. From the start I watched Taylor Ward take off with Rachael and Rena going after her. Rachael and Rena paid for it later. So did David Taylor. I caught up to David first around 2.7 or so on the uphill. He was able to latch on, however. Then as we caught up to Rena I could tell she was not in the same shape as she was last year and struggling from the fast start. When I race I normally just race. But this time I decided to do something different. I figured I am old, I have done enough of my own racing. So I slowed down and invited her to draft. She tried for about a quarter, but was not up to it. I figured at this point she would not be catching the women ahead of her, so I started racing again. Dave pulled ahead in the meantime, but I was able to catch him again around 4.3 or so. Then I pulled ahead following a runner in front of me and we passed Rachael. I saw the Trax train that was suspiciously moving forward lookng like it really did not want to wait for the runners to pass. Fortunately it waited for us. Unfortunately it did not wait for the runners behind us. So Rena and Polina along with a few others ended up losing a few seconds waiting for it to pass. James Moore passed me around 5.2 but I was able to latch on. Unfortunately not for long. I lost contact around 5.6. He ended up with 34:01. Ran a cool-down with Jenny and Polina, and another 0.5 with Matthew in Denver. Kids overall ran shorter distances tapering for the Nationals. In Denver. I did 9 total. Julia, Jenny, Joseph, Jacob, and William all ran 3, Matthew 0.5. Then we drove to Emporia, KS. Total of 11. Some in Emporia, some in Lawrence at the venue. Stephen ran 3:25.81 (1:42.54,1:43.27), but was disqualified for improper lane change. Rightfully so, he was running goofy and was all over the place. Well, there was a reason for him to be goofy. The meet got delayed about an hour and a half due to lightening on top of the required 45 minute wait after check-in which was after a 75 minute drive, which was after two days in the car. This was too much for a six year old to handle. But at least he started and finished the race and in a time that was only 8 seconds slower than his PR. Jacob ran 2:37.48 (1:16.76, 1:20.72) which got him 42nd place out of 55. Joseph ran 2:32.79 (1:14.74, 1:18.05), 36th place. It took 2:20 to qualify for the final, though we did not care too much about that as we were not planning on it anyway as it is on Sunday. In Emporia, KS. Usual distances for everybody except the ones that were tapering. With Jenny, Julia, Joseph, Jacob, William, and Stephen. A pickup with Jenny, Joseph, and Jacob. A pickup with William and Julia. Most of the run in Emporia. Kids ran their usual distances except for the ones that were tapering for tomorrow. Then we met April from the blog in Eureka. William and I paced her through a quick mile in 6:25 to assess her fitness. Some distance + race pace pickup with Joseph. On my own. Did a pickup. Paced April on the track with William. Today was a busy day. Joseph, Jacob, Jenny, and Julia ran in the USATF JO Nationals in the 3000. We got up early to make the 75 minute trip from Emporia, KS to Lawrence, KS. I did some running at the venue - some just to get around, some with the kids that were either cooling down or not racing and getting their runs in. Then we drove to Denver (more precisely Thornton) where we stayed with James and Lybi. Sarah and I did some creative running there - we literally ran to Walmart, then I ran back and got the car while she shopped. Joseph ran in heat 3 - the fastest. In spite of starting out last in the first 150 meters he got carried away in the early parts of the race. When I saw he had 2:38 at 800 meters I thought maybe he is just more fit than I thought he was, but it ended up being not the case. The first 1 K in 3:20 resulted in slowing down to 3:38 and then 3:39 in the last 2 K. What is funny is that in spite of crashing he was still moving through the field for most of the race - they crashed worse! But he ran a small PR which is not to be taken for granted considering all of the travelling and awful pacing. My 2000 formula predicted 10:28 based on his 2000 at altitude time trial in 6:59, which I believe he would have run if he could just hold his horses enough to run something like even 40-82-82 in the first 1 K.
He had more self control than Joseph - enough to let everybody gap him in the first 200 and to stay in last place up until around 600 mark. Unfortunately even with that the start was still too fast - I would have preferred the first 200 in 41 followed by 85-86 laps. He also spent a lot of time in lane 2 being a bit indecisive about passing people. We need to practice passing with authority. I need to teach the boys, Jacob in particular, that when you pass, you should normally pass to drop and get up to the next target ASAP, then draft to rest if the target is moving well, then repeat. If you cannot pass to drop, you should be drafting. One exception to that is if the target has a competitive personality and is moving at about 5 seconds a mile slower than what you want to do. Then you can pass to egg on showing a bit of weakness on purpose making the target speed up for a lap or two and once that happens, go back to drafting. My prediction for Jacob from the 2000 workout in 7:12 was 10:48. I think the fast start and too much running in lane 2 caused the discrepancy. Julia - 13:01.01 34th place. Things were going OK until the last 1 K. She would have gotten a PR with a decent finish. Jenny missed her PR by 2 seconds. Again, it slipped away in the last 1 K. Probably had something to do with the temperatures getting warmer, and her not being a very good heat runner. But she was able to move through the field after starting dead last and make it into 12th place. With Joseph, Jacob, some with William and Jenny. With Sarah to Walmart in Denver. Back from Walmart alone to get the van and pick up Sarah.